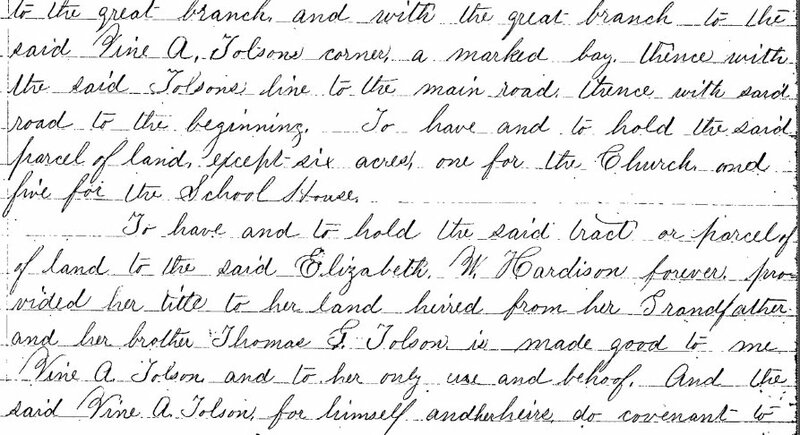 ...land situate in the and bounded and described as follows lying on the North West side of the Meeting house Branch Beginning Where the Main Road Crosses said branch thence down the branch to the great branch and With the great branch to the said Vine A. Tolsons Corner to a Marked bay. 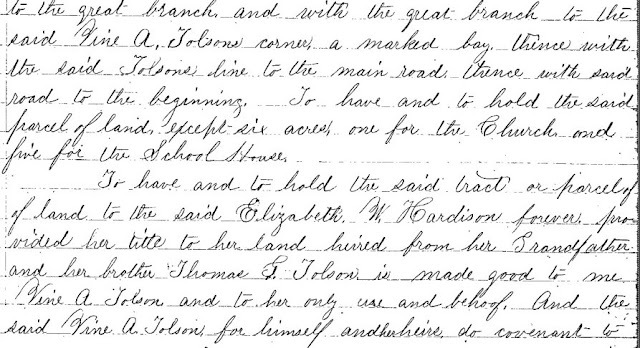 Thence the said Tolson line to the Main Road thence With said to the Beginning. In the above tract of land there six acres to be Excepted for the use of the Church and School house the Remainder the said part of the second parties. 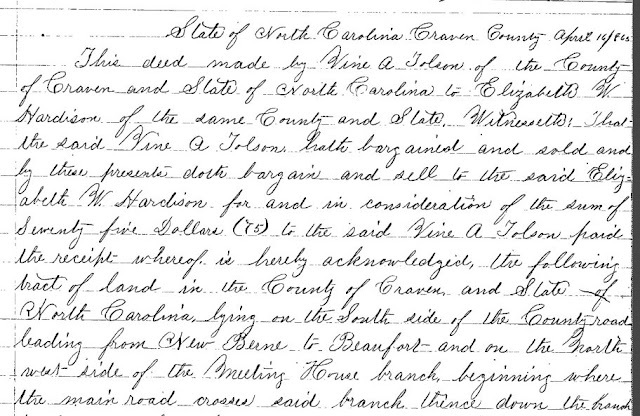 Here's a listing for a purchase of land by Elizabeth Hardison from Vine Allen Tolson. Now check this out. This deed made by Vine A Tolson of the County of Craven and State of North Carolina to Elizabeth W. Hardison of the same County and State. Witnesseth: That the said Vine A. Tolson hath bargained and sold and by these presents doth bargain and sell to the said Elizabeth W. Hardison for and in consideration of the sum of Seventy-five Dollars (75) to the said Vine A Tolson paid the receipt whereof is hereby acknowledged the following tract of land in the County of Craven and State of North Carolina lying on the South side of the County road leading from New Berne to Beaufort and on the North west side of the Meeting House branch beginning where the main road crosses said branch thence down the branch to the great branch and with the great branch to the said Vine A Tolsons corner a marked bay thence with the said Tolson line to the main road thence with said road to the beginning. To have and to hold the said parcel of land except six acres, one for the Church and five for the School House. 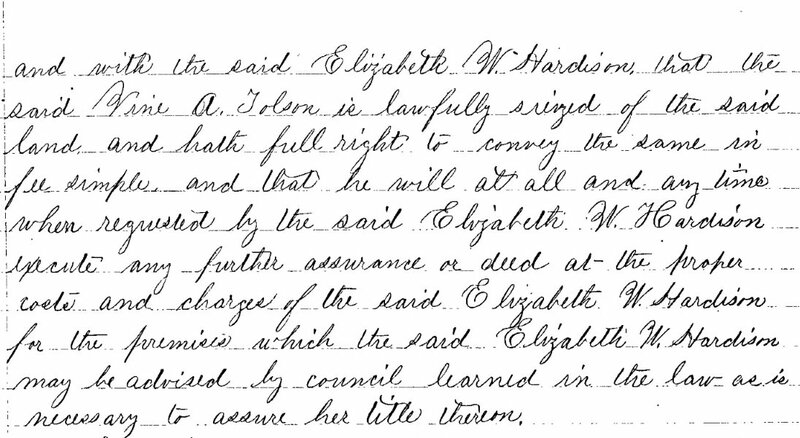 To have and to hold the said tract or parcel of land to the said Elizabeth W. Hardison forever provided her title to her land heired from her Grandfather and her brother Thomas G Tolson is made good to me Vine A Tolson and to her only use and behoof. 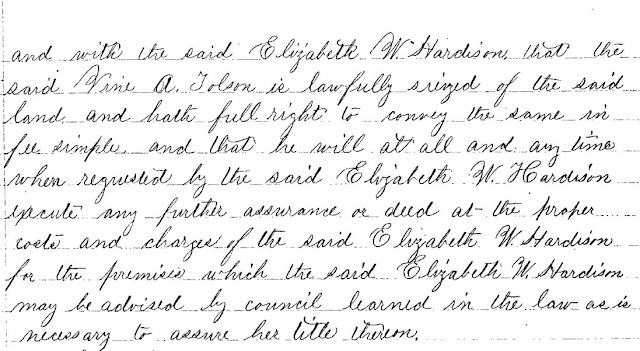 And the said Vine A Tolson for himself and her heirs do covenant to and with the said Vine A Tolson is lawfully seized of the said land and hath full right to convey the same in fee simple and that he will at all and any time when requested by the said Elizabeth W Hardison execute with further assurance or deed at the proper costs and charges of the said Elizabeth W Hardison for the promises which the said Elizabeth W Hardison may be advised by council learned in the law as is necessary to assure her title thereon. 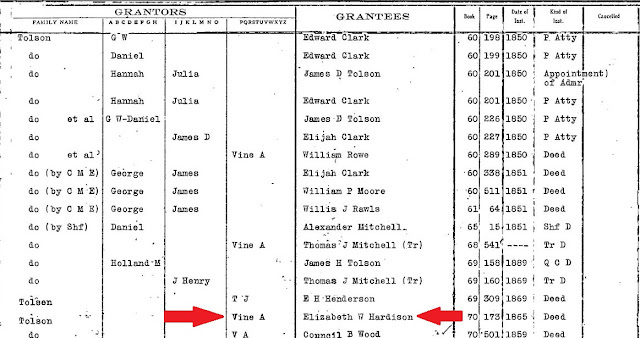 Then was the due and legal execution of the foregoing deed acknowledged before me by V. A. Tolson, the grantor therein named. Let said deed with this certificate be registered. 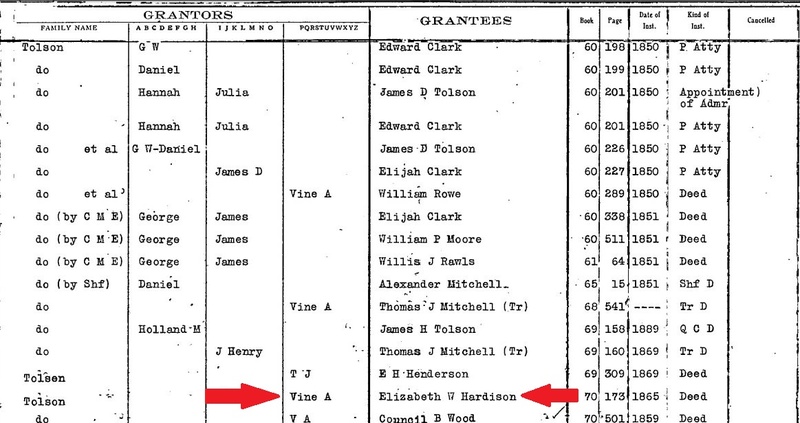 The land my 3rd great grandfather Mortimer Mitchell purchased from Elizabeth in 1878 was the very same land that she had purchased in 1865 from her half-brother Vine Allen Tolson. P.S. Hey, y'all I know I've been away for a bit. 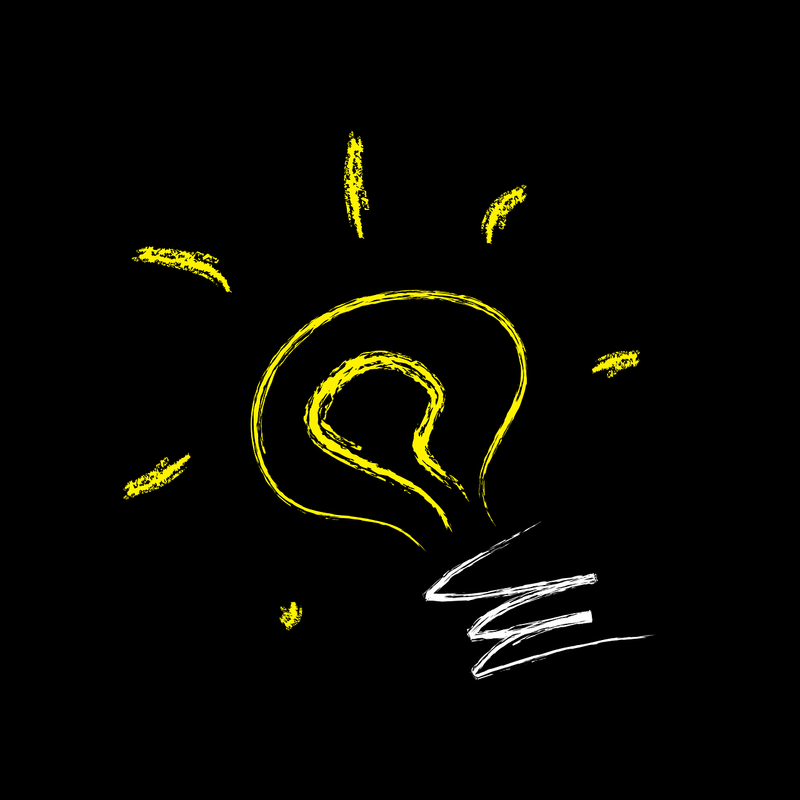 I am going to try to get back to posting more consistently now. I've been feeling the itch to write up some stuff so stay tuned.